Photo: Henry M. Flager Mansion, ca. 1900-1902, 1900 Whitehall Way, Palm Beach, FL. 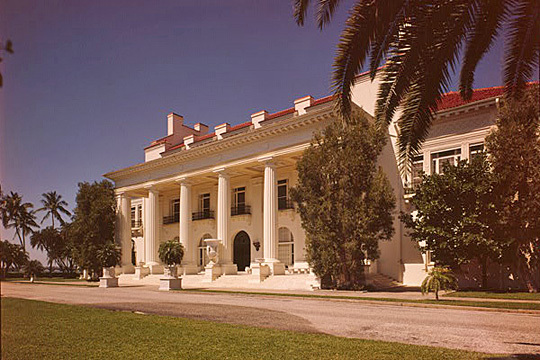 The Mansion called "Whitehall" was designed for a wedding present to Mary Lily Kenan of North Carolina by her husband, Henry Morrison Flagler, one of the most important men in the early development of the South Florida East Coast. Part of his extensive hotel complexes, Whitehall remains also as one of his seasonal homes and places of entertainment. It was the work of two of America's greatest architects, John Merven Carrere and Thomas Hastings. Listed on the National Register of Historic Places in 1972. Listed on the National Register of Historic Places in 1972. Palm Beach County government offices are located at 301 North Olive Avenue, West Palm Beach, FL 33401; phone: 561-355-2030. At 2,000 square miles, Palm Beach County is larger than the states of Rhode Island and Delaware. With nearly 50 miles of beaches, the area's legacy of resorts began in the late 1800s. In 1909 Palm Beach County was created by division of Dade County, and West Palm Beach was designated as the county seat.